Who can deny the thrill of the grill? There's nothing quite like cooking over a live flame. 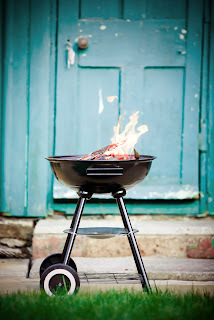 But if you're one of the many who find grilling intimidating, that irresistible fire-kissed flavor can feel out of reach. Fear not: Whether you're a newbie or want to expand your repertoire, a little know-how is all you need for grilling success. In this guide you'll find an explanation of how to set up your grill, the classic techniques of live-fire cooking, and extras such as grilling safety. And at right are basic recipes for everything from steaks, burgers, and chicken to whole fish, pork chops, and shrimp. Plus, see our equipment guide for the lowdown on what kind of grill to get and other essential gear. Read on and, before you know it, you'll be the one hosting the next cookout. In America, we tend to call just about anything that has a red color or a red sauce on it barbecue, but it's important to distinguish barbecue from grilling. While both involve cooking with live fire, barbecue traditionally refers to food that is cooked slowly over a low (indirect) heat and flavored by wood smoke. Grilling, on the other hand, is a hot-and-quick method that uses high (direct) heat. Need more help? Check out the FAQs at Girls at the Grill.